It was an amazing experience and a dream come true for my wife and I to join a Buddhist pilgrimage to India organised by one of the leading tour operators in Sri Lanka recently. We were overwhelmed by the beauty and serenity in particular of the four main places of Buddha’s life- Lumbini (Nepal), Bodhgaya, Saranath and Kushinagar. The State governments of India and the Maha Bodhi Society (founded by Srimath Anagarika Dharmapala- who revived Buddhism and the holy sites) must be complimented for maintaining these sites and the surrounding areas neatly and beautifully, in spite of the many thousands of pilgrims who visit every year. Although having to travel eight to 10 hours by coach at times to go from one site to another on bumpy and congested roads, with unhygienic washroom facilities en route, basic food and hotels, we were pleasantly surprised at the number of pilgrims from South Asian countries who undertake this pilgrimage. As a result, it is not only the hotels and people in these areas that benefit and prosper by these ‘tourists’ visiting but also the temples including Sri Lankan ones, from their generous donations. With Sri Lanka too having a similar opportunity to attract these South Asians, I recommend to the Sri Lanka Tourism Promotion Bureau under its new dynamic Chairman to promote Buddhist pilgrimages to our own Golden Triangle during June to September (being the main tourist off season in Sri Lanka and pilgrimages to Bodhgaya) with visits to Anuradhapura (Sri Maha Bodhiya- branch of the original Bo Tree in Bodhgaya and Ruwanveliseya), Polonnaruwa (Somawathiya Chaithaya) and Kandy (Sri Dalada Maligawa- only Tooth Relic of Lord Buddha) with Kandy Perahera and Dambulla Cave Temple (UNESCO World Heritage site), Sigiriya and surrounding cultural sites being added attractions. Our better air travel connections, road network, shorter distances/comfortable travel, beautiful scenery, quality hotels, washroom facilities, food options, fruit varieties, etc are a definite advantage when promoting such tours. This would not only bring in more tourists /foreigners to the country but also help the areas, temples and people in this triangle to develop and prosper. I also suggest the Buddhist Cultural Centre opens sales outlets in Anuradhapura (between Sri Maha Bodhiya and Ruwanveliseya) and also in Kandy beside the Dalada Maligawa for the benefit of pilgrims. Once again, the two main roads to enter Kandy city were made ‘One Way’. This was done about three years ago and since it wasn’t practical, it was reversed. This time the authorities tried to impose it forcibly against the wishes of the general public and it led to protests. Now it has been suspended once again. This ‘one way’ may be convenient and faster for outsiders. 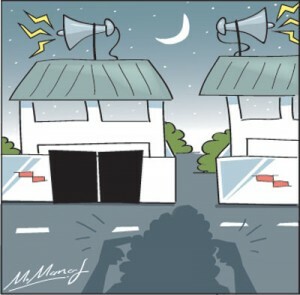 But for Kandy residents, it is a great inconvenience. A person living close to Kingswood College has to drive an additional 6 km to reach Kandy town. A person living close to Upper Road Katukele has to go to Getambe by one bus, and from there to Kandy town by another with additional cost and a distance of 8 km (earlier it was just one km and one bus). n Construct two or more cross roads connecting upper and lower roads between Getambe and Kandy. Widen the present cross roads. n Open the road adjacent to the old Courts complex behind the Temple of the Tooth to vehicles so that long distance vehicles unnecessarily entering Kandy town could be minimised. n Complete work on the already commenced second railway line from Kandy to Peradeniya junction railway station (the construction work of this 5km distance has taken more than five years now). Make it a one way railway line. n Construct two flyovers over one level crossing at Getambe and the other one over the level crossing opposite the the Post Office Kandy. (Flyovers are common nowadays and seen in other parts of the country- at Veyangoda, Dehiwela, Nugegoda, Kelaniya etc. They are relatively more cost effective than the proposed underground roadways in Kandy). Something needs to be done to relieve the problem of traffic congestion in Kandy that results in heavy traffic jams and air pollution. A very high percentage of citizens in Kandy suffer from respiratory ailments. Two schools in our neighbourhood, Girls High School and Buddhist Girls School in Mount Lavinia held Pirith using loudspeakers all night within the last two weeks. It was loud enough to keep us awake throughout the night. As I write the local tuk drivers operating a loudspeaker under our Bodhi tree have switched on the Pirith which they gift us with daily and have gone away on hires, leaving us with over two hours of chanting. Modern loudspeakers are sophisticated and controlled to ensure efficiency. Could someone please control them and let ordinary citizens live their lives in peace. If there is a law, no one is implementing it. Kusal Perera’s 150 in the second innings of the first Test against South Africa is being acclaimed as perhaps one of the best Test innings in the history of Test cricket. There are a few lessons that all of us should learn from his innings. Kusal did not celebrate individual milestones in his innings. His individual 50, 100 and 150 were celebrated very quietly. His main celebrations were when his team won the match. This was spontaneous. This teaches us all an important lesson. We always like individual benefits but the welfare of the country or the team is more important. As a citizen of Kandy for the past almost six decades, I should know and feel the ‘heart of Kandy’. It’s a laid back, but beautiful and cultured city, and I am sure many of its citizens would like it to remain so. If anything needs to change, let its citizens ask for it please. Without solving the traffic build-up at Getambe, in the morning rush hours and the similar build-up of traffic at the entry point to Kandy city proper in the evening hours, no traffic plan will work. The Kandy City Police are well aware of this. Why not let their innovations seek a solution. We do not want impositions by a recent parachutist to power, however blessed by ‘Polonnaruwa’, to create chaos in our city. ‘Letters to the Editor’ should be brief and to the point.